Week 8: Home Stretch but No Time to Rest! “Where is the outrage?” asked Sen Robert Byrd when it became apparent that the alleged Weapons of Mass Destruction used as the excuse to invade Iraq were nowhere to be found. He was asking the right question! Right now at the legislature, we are dodging Weapons of Mass Distraction as we are continually dumbfounded by the attacks on workers, women, water, & diversity, and yet must sustain the outrage as we organize and resist. Friday’s public hearing on the bill to roll-back water protections was an excellent show of outrage at SB 423, which would undo many of the protections from last year’s bill to regulate storage tanks like the ones that leaked, creating the water crisis. 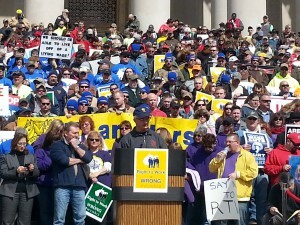 A much more dramatic display of outrage occurred on Saturday when over 5,000 union workers converged on the Capitol to listen to national labor leaders, including AFL-CIO national president Richard Trumka. They are outraged by the attacks on prevailing wage, worker safety, Workers Comp protections, promotion of “Right to Work” and Charter Schools. 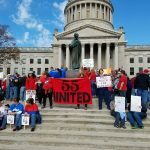 See http://youtu.be/Ys4AxYpEs9o for a short sample of Saturday’s rally with music by Delegate Mike Pushkin, also read coverage in the Charleston Gazette. On Thursday, the House gallery was filled with police in uniforms outraged by SB 347 which passed the Senate allowing legal gun owners 18 & over to carry a concealed weapon without first obtaining a permit or any handgun safety training. Who besides the gun nuts are clamoring for this roll-back in public safety? National group “Everytown for Gun Safety” just did a WV poll on this bill and a whopping 71% of potential 2016 voters opposes this gun safety roll-back. 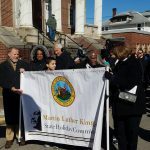 However, Saira Blair, the nation’s youngest state legislator, said on Decision Makers Sunday morning that this is the only issue she has received calls on and they were all supporting it. Maybe she should get some opposing calls? Nurses were so outraged at what the legislators did to their APRN bill that they pulled it off life support and let it die. It had become so onerous that the status quo was actually better than practicing under the rule of the Board of Medicine (Docs) instead of the Nurses Board where they now were regulated. Teachers are outraged that the Charter School bill (SB14) was actually made worse than the version that passed the Senate when it was taken up by the House Education committee. 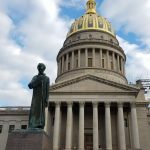 One amendment that has Fairness WV up in arms removes specific protections for the LGBT community in hiring and enrollment in these proposed alternative schools. 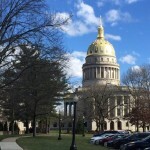 Alternative energy advocates are outraged over the mess the legislature has made of WV Net Metering rules and asking Governor Tomblin to veto HB 2201. Before this session, our Net Metering law was a model for the nation. Now it’s mired in legalese written by the Big Power companies to short circuit the growing solar and wind industry and the jobs created there. West Virginia is already behind the curve on the emerging industry. We can’t afford to stall solar and wind development with legislative road blocks. Call our governor and ask him to undo the damage with his veto pen! SCR13 is one of the “sleeper bills” we’ve been warning you about this session. It’s actually a resolution calling for a full-blown constitutional convention of the United States supposedly to pass a balanced budget amendment. The problem with this (full convention) approach is that, once convened, such a convention would have no limits on its powers and we could emerge with a totally re-written document! See Betty Rivard’s op-ed and then call your members on the Senate Finance committee (and the chair) to ask them to vote no on an unfettered rewrite of our Constitution. This unlucky resolution is on their agenda for Monday the 9th at 3PM! Our challenge now is to sustain this growing outrage over these radical attacks on workers, women, water, and social fairness and carry it over into activism right through the elections in 2016. Unfortunately, we’ll have yet another dose of this radical legislative agenda this time next year. What will they come up next time? One thing Senate President Cole has mentioned is cutting taxes. Considering that we’ve been using the “Rainy Day Fund” to plug deficit holes in the past two years this can only mean more cuts for education, social programs and more potholes in our poorly maintained roads. Keep the outrage flaming and use it to stay engaged during this final week of the session! One final way you can express your outrage is by becoming a supporting member of WV Citizen Action. 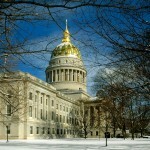 Send your checks to 1500 Dixie St, Charleston, 25311 or online at www.wvcag.org. Encourage your friends to do the same! 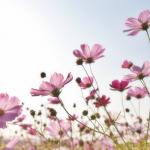 Thanks to all who have become new members or renewed! The committee substitute for S.B. 423, “Amending the Aboveground Storage Tank Act” is before the House Judiciary Committee today. Environmental and citizen groups do not support this bill because, event though it is better than the introduced version, it is still a weakening of last year’s SB 373. Incorporate DEP’s risk-based rule. SB 423 does not incorporate DEP’s rule and would cause another year to go by without AST regulations in place – other than the initial registration, initial spill plans, and initial inspections. DEP’s Proposed AST Rule (47CSR63) was developed with extensive public input from industry and citizens to implement the Act. The rule divides tanks into three levels and requires more stringent protections for tanks that present the highest risks. Tanks that pose a risk to water supplies must be included. SB 423 exempts approximately 36,000 tanks from regulation under the Act. Roughly one-third of the deregulated tanks are located within 1,000 feet of a river or stream. These tanks should continue to be regulated under the Act as they are most likely to contaminate water if they should fail. Include stringent and explicit standards and accountability for tank and secondary containment integrity. The Freedom Industries disaster could have been avoided by regular tank inspections and a well-maintained secondary containment system. SB 423 rolls back inspection requirements. Self-inspections should occur at least annually by qualified personnel. Tanks close to water intakes need to be inspected by DEP annually. 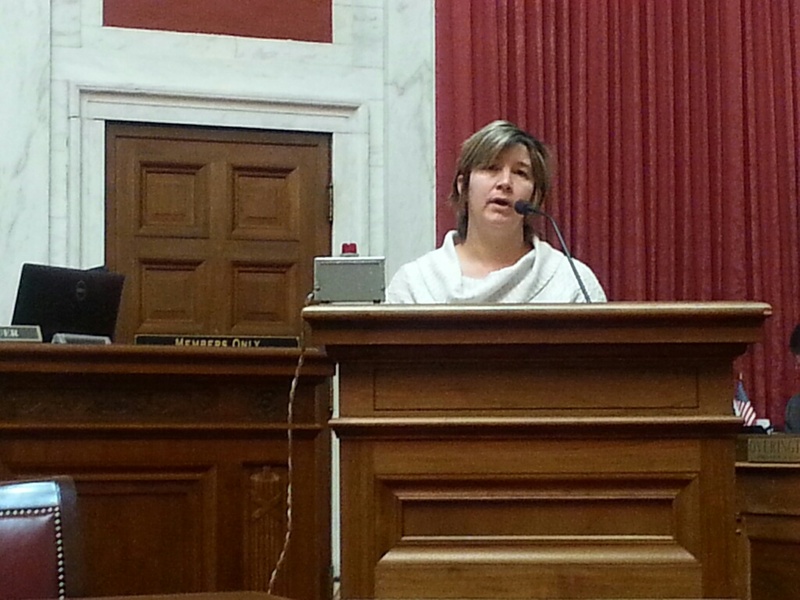 SB 423 rolls back Spill Prevention and Response Plan requirements. SPRPs need to be submitted to DEP and updated every 3 years, and must include info on stored chemicals. SB 423 rolls back permit requirements. Individual permits for tanks closest to drinking water intakes should be required. SB 423 creates an alternative means of compliance for nearly all tanks through modifications of existing permits or plans. SB 423 gives the DEP Secretary full discretion as to what standards are sufficient to protect waters of the state. It needs to explicitly require that modifications to permits or plans be as stringent as the standards in the Act so as not to create a loophole in regulation of ASTs. Public notice of these modifications should be required. Require necessary information for source water protection planning. SB 423 creates new restrictions on disclosure of information that could prevent water utilities from being aware of threats to the water system. Information about the location and contents of tanks, including data on stored chemicals, must be shared with water utilities. Here is a link to Ken Ward’s article that followed last Friday’s public hearing on SB 423. Look for an update after today’s committee meeting! SB 352, the bill that started out as a recycling bill, but has become much more, was passed by the full Senate and is now in the House of Delegates. 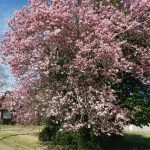 The bill provides a way to let businesses and families band together to haul recycling by forming a cooperative together, as well as allowing for other types of agricultural cooperatives. 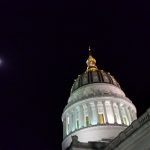 It is this latter part of the bill that has garnered the support of some other prominent organizations: the WV Food & Farm Coalition and the WV Chamber of Commerce. You read that right, for the first time in a long time (maybe ever), CAG is working with the Chamber to get a bill passed. There is also bipartisan support for the bill, both for its impact on recycling and small businesses. Getting this bill passed is one piece in helping fix the recycling problems in the state. Last week we told you about a terrible bill working its way through the Senate, which would significantly increase contributions limits and repealing our long-standing prohibition on corporate contributions under the guise of increasing transparency and accountability in elections. Fortunately, things turned around and SB 541 his been significantly improved, to the point that we can actually support the bill. Although the bill isn’t perfect, amendments adopted by the Senate Judiciary Committee cap contribution limits to candidates at the federal limit ($2,700 currently), but allow higher contributions of up to $10,000 to political party and party caucus committees; restore language prohibiting direct corporate contributions, keeping our corporate contribution ban in place; and most importantly strengthen disclosure of outside political spending. It’s hard to express how relieved we are by this turn of events. This change in direction was due to Senate Judiciary Chairman Charles Trump (R-Morgan) for pushing members of both parties to come to a reasonable compromise. Senator Trump offered the amendment that restored the corporate contribution ban. 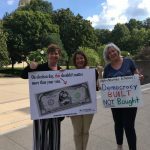 Democratic members of the committee deserve praise for standing firm against excessive contribution limits, and insisting that we not go above the federal limits, although the amendment making this change was offered by Senator Mitch Carmichael (R-Jackson), one of the bills sponsors. To their credit, Senator Carmichael and other Republicans on the committee, with the exception of Robert Karnes (R-Upshur), supported an amendment offered by Senator Mike Romano (D-Harrison) that strengthens disclosure of third party political spending and would increase transparency and accountability in our elections, which they claimed was the goal of the bill. Senator Art Kirkendoll (D-Logan) probably had the quote of the day, when he argued it was hard to justify taking contributions in excess of the federal limits. Candidates wouldn’t be able to “erase the smell,” he said, if they allowed themselves to accept tens of thousands of dollars from one individual. The Charleston Daily Mail had an excellent article on the discussing the changes made to the bill, and there was also a segment devoted to the bill on Tuesday’s edition of the Legislature Today. Thanks to everyone who took time to contact Senate Judiciary Committee members and your legislators about the bill. The bill passed the Senate 28 to 6, and was on the House Judiciary Committee agenda Sunday evening. Unfortunately, the committee removed provisions that required increased disclosure by groups that spend huge sums of money to influence our elections without divulging the names of their donors. The Senate took several days and many meetings to come up with a bi-partisan bill that everyone could agree on, and which passed overwhelmingly. The House Judiciary’s rewrite was rushed through in a few hours and passed on a strictly party-line vote. During the committee discussion it was noted that there is a $100,000 a plate breakfast planned by a secretive conservative group on Tuesday in Charleston (read more here and here) and that the disclosures removed from the Senate bill will continue to allow these types of groups to hide their donors, while passing along huge sums of money to others who spend it to influence elections. Please contact your delegates and tell them to vote “No” on the amended version of SB 541. 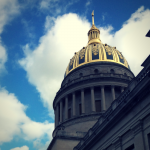 Allowing more money into our elections without increasing disclosure is self-serving and keeps West Virginians in the dark about who is trying to influence their votes. 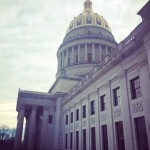 Click here to sign a petition to House of Delegates members and Governor Earl Ray Tomblin asking them to oppose the bill. Wed. is the WV NORMAL Fundraiser at the Empty Glass. Thu. is the rescheduled WV-FREE PAC fundraiser at the Red Carpet.